For a long time, the most popular non-lethal self-defense product has been the keychain pepper spray. What makes it so popular is that an individual is able to defend themselves when they are most vulnerable- walking to or from their home or car. With the pepper spray attached to a key ring, it is readily available and can be used at a moment's notice. 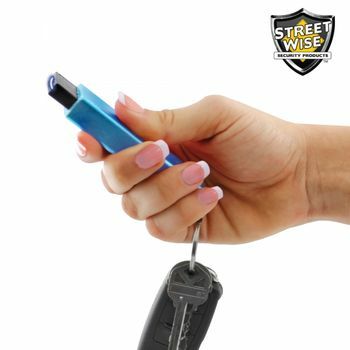 About five years ago we asked the question, 'if the keychain pepper spray is so popular, why not offer a powerful keychain stun gun in a similar size'? 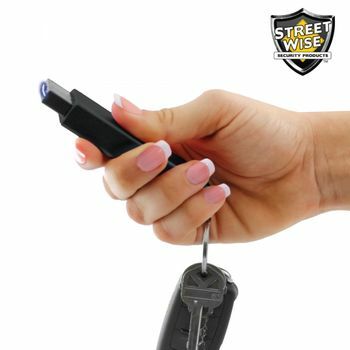 The result revolutionized the stun gun industry when we introduced the original Streetwise S.M.A.C.K. (Stun My Attacker Compact Keychain) Stun Gun.This amazing stun device was about half the size of stun guns on the market at that time and was light enough to be carried on a key chain. Well technology has improved a lot in the last 5 years, and now we are happy to introduce the Mini S.M.A.C.K. 20,000,000 which is about half the size of the original model. It is similar in size to a small pack of gum (measures a mere 3.25 in. x .75 in. x .50 in.) making it the smallest keychain stun gun in the world!